I received a bunch of emails asking me to make a tutorial on Java XPath. I guess you liked my previous XML XPath tutorial? 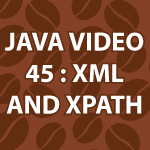 XPath can be used to easily grab data from an XML file and into your Java code. I’ll cover how to write to an XML file the easy way in my next tutorial on JDOM2. All of the code follows the video, and it is heavily commented to help you learn. // Document, Element, Node, NodeList, Text, Exceptions, etc. i would like to have compare two xmls which is having the namespace. Please explain how we can do it. That is because your xml does not have any elements. thx dude, i really need this! !